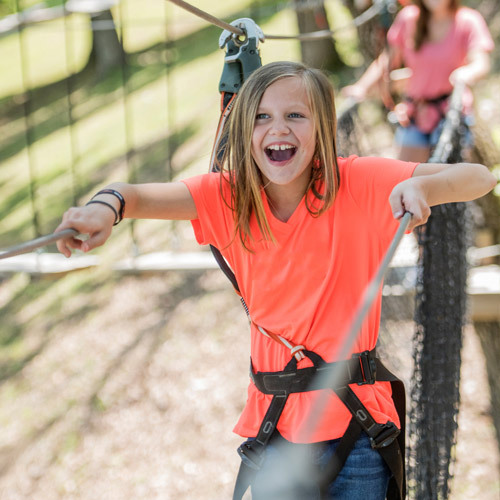 Adventure Park is one of the hottest new attractions in the Smoky Mountain area and is conveniently located directly across from Five Oaks Tanger Outlet Mall on the Parkway in Pigeon Forge. The zip line tour will send you soaring through the hills on seven ziplines from 450 to 2,500 feet long! One paid admission gets you rides on all SEVEN ziplines! Come and enjoy this adventure with family and friends! Brand new attraction with ziplines 450-2,500 feet. Zip-line tours cover 1.5 miles. If a child 3+ weighs less than 70 pounds a guide will ride tandem with them. Zip in rain, but not lightning. Tours last 2 1/2 to 3 hours. Must be at least 3 years of age and weigh 70 lbs. Our most popular tour features 7 ziplines from 450 to 2,500 feet long! One paid admission gets you rides on all SEVEN Ziplines. 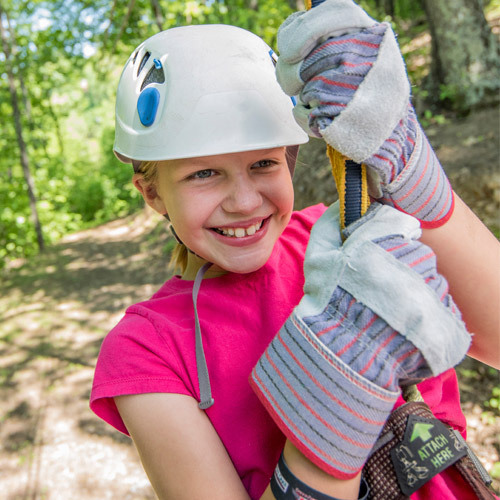 Adventure Park at Five Oaks (Sevierville, TN) is one of the hottest new attraction in the Smoky Mountain area and is conveniently located directly across from Five Oaks Tanger Outlet Mall on the Parkway. Complete with ground-school, experienced guides and all the gear you'll need, our zip line tour will send you soaring through the hills at a price you can afford! It all starts with a ride up to our tower 1 and ends with our most thrilling line of all where you get to race your friends and family on our lines stretching over 2,500 feet long! Due to safety concerns we cannot allow anyone who is pregnant to participate on any of our tours and riders must be at least 3 years of age and weigh between 70 - 270 pounds so momentum can get you from one end to the other with no problem. If a child 3+ weighs less than 70 pounds one of our friendly guides will go tandem with them. Please wear closed toe shoes - no opened toed shoes allowed. All children under 16 years of age must be accompanied by an adult 18 years or older. Ziplining is very safe. 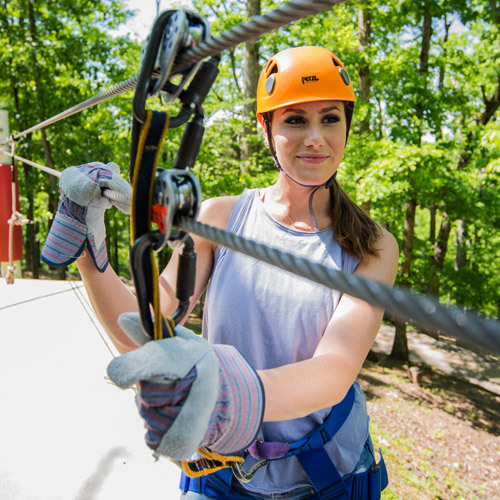 Any adventure trip carries risk but the Adventure Ziplines of Pigeon Forge course was designed to be as safe as possible. Only the highest quality equipment is used and everything is checked daily by our experts, who are professionally trained. 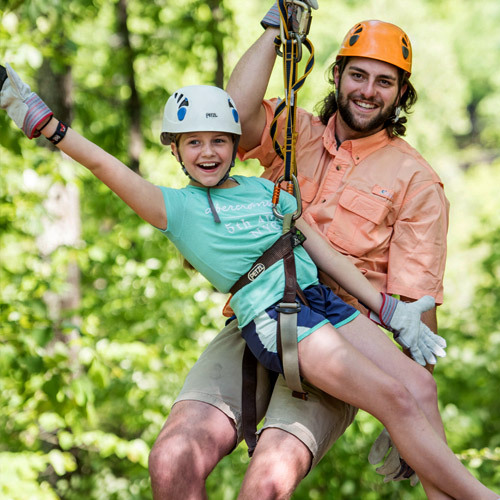 How long is a zipline adventure at Adventure Ziplines of Pigeon Forge? If you’re taking a tour, you’ll probably spend 1 ½ hours on the tour. There is a 20 minute training session and the canopy tour generally last around 1 hour and 15 minutes. Is there a lot of walking or hiking involved with the tour? No, as you are transported to the first tour aboard an ATV. However, there are 15 steps to climb at the start and finish of the course. 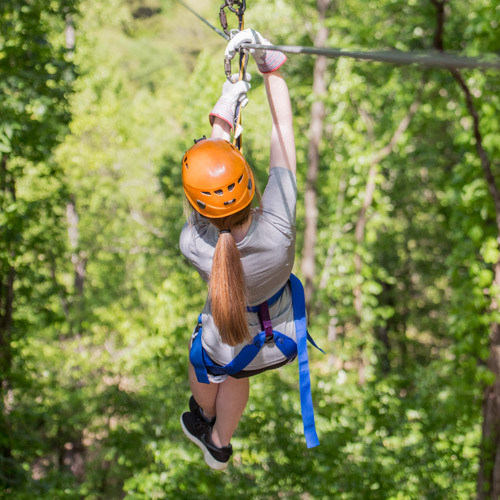 Can anyone go on a zipline tour at Adventure Ziplines of Pigeon Forge? All riders must weigh at least 70 pounds and cannot exceed 270 pounds. Any child who is between the ages of 6-15 must be accompanied by an adult at all times. Pregnant women are not allowed to zipline. What should I wear for my zipline adventure? Wear comfortable clothing. Skirts and dangling jewelry is not recommended. Closed toes shoes are required and long hair should be tied back. Please remove anything from pockets as well, like cell phones, so they do not end up lost on the forest floor. Do I have to wear special equipment? Your zipline guide outfits you with everything you need. You’ll be given a helmet, gloves, trolley system (which moves you throughout the cables), and two lanyards with safety clips. How many people can go together? 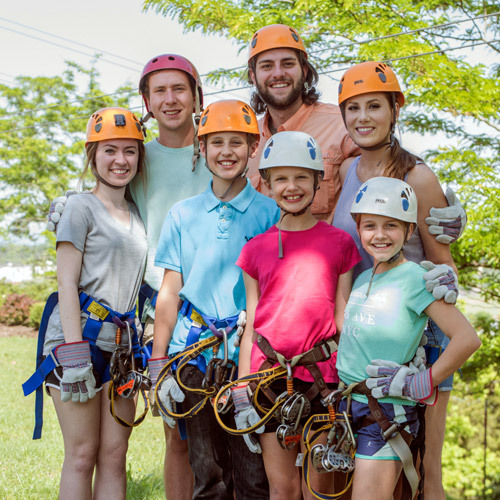 Adventure Ziplines of Pigeon Forge allows up to eight people per tour. Contact us for support or help booking your trip at 844-993-3195.